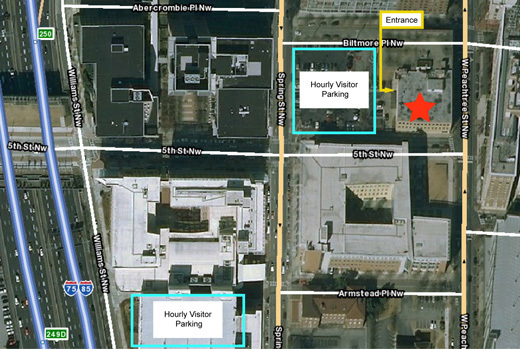 Visitor parking is available on the streets around the Technology Square buildings. Visitor parking is also available at the Georgia Tech Hotel parking deck entrance located on Spring Street NW, between the Georgia Tech Hotel (800 Spring Street NW) and the Economic Development Building (760 Spring Street NW). Additionally, there is a visitor parking lot adjacent to 828 West Peachtree, directly North of the College of Management Building. 828 West Peachtree is a 3 story yellow brick and stucco building on the northwest corner of West Peachtree and 5th Streets, across 5th Street from the Scheller College of Business Building. The entrance to the BBISS office is on the west face of the building, opposite of the side that faces West Peachtree. The entry door is to the left of the GT Parking Office door. It is marked “828 West Peachtree Street, NW” and has a wayfinding placard mounted to the right of the door. Once in, take the elevator to the 3rd floor, proceed down the hallway to the left, and enter the second door on the right. If you have any difficulties, please call 404-894-7895.